You are a Guardian of the last safe city on Earth, able to wield some of the Traveler’s incredible power. 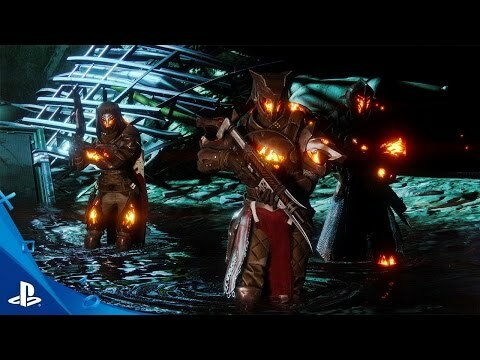 Destiny is a next generation first person shooter featuring an unprecedented combination of cinematic storytelling, cooperative, competitive, and public gameplay, and personal activities that are woven into an expansive, persistent online world. Venture out alone or join up with friends. The choice is yours. Become Legend. Beneath the surface of the Moon, a long-forgotten enemy stirs. Survive the true depths of the Hellmouth, and stop its dark army from invading Earth. Expand your Destiny adventure with a wealth of weapons, armor, and gear earned in new story missions, three new competitive multiplayer arenas, and a new cooperative Strike and Raid. The wall which stood for centuries along the southern border of Old Russia has collapsed, a battle-scorched reminder that our enemies still seek to destroy us all. Fallen mutants now scavenge the tombs of the Golden Age, and the plague they have unearthed in the wastes is more dangerous than even they understand. Join Lord Saladin. Journey into the Plaguelands. Learn the fate of the Iron Lords and stop the growing threat before it is too late. Destiny game, The Taken King (includes Expansions I & II), and Rise of Iron also sold separately. Subject to availability. If you buy Destiny – The Collection, please do not purchase Destiny game, The Taken King (includes Expansions I & II), and Rise of Iron as you will be charged separately for them. A minimum of 60 GB available hard drive storage space required for PS4 as of September 2016. Storage space requirements are subject to change and may increase. If you purchase after September 2016, please visit www.destinythegame.com/size-requirements for current storage requirements prior to purchase. Additional storage may be required for setup, updates, and features. There may be mandatory in-game updates which users must download to continue playing and which may require additional storage. Broadband internet required. Users responsible for associated fees. Additional charges can apply for online content and some features. Various elements and functionality of PS4 Destiny game require PlayStation Plus subscription, sold separately.